Presbyopia, or far-sightedness, is a common condition that often starts to affect those over the age of 40. If you already wear glasses for distance vision, and are later on diagnosed with presbyopia, you don’t have to carry a separate pair of reading glasses. Multifocal lenses, which rectify problems with both near and far sight, allow you to see well at all times, with one pair of glasses. Multifocals are far superior to bifocals. Bifocals did correct problems with both near and far vision, but usually objects in between were blurry. To create a better product, progressive lenses were made, which give you a transition region which lets your eyes to focus on distances that are somewhere in the middle. Progressive lenses, which are also called no-line lenses, are a type of multifocal lens featuring a gently curved lens, instead of an obvious and harsh line dividing the two areas of the lens. This creates not only better vision at all distances, but also good transitions in between. Progressive lenses, although better, can require some time to get used to. Even though the gentle lens curve is more elegant, the lens’s areas of focus are small, so they they’re all able to fit. Bifocals aren’t entirely dated though; they are used to treat kids and teenagers who suffer from eye strain, which is the result of a difficulty focusing while reading. When you go get fitted for multifocal lenses, make sure it’s with an eye care professional you trust. 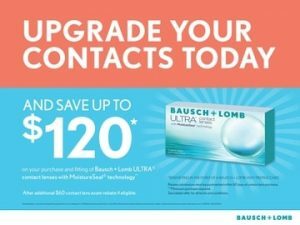 Multifocal lenses are most beneficial when properly fitted to your unique eyes, prescription and line of vision. Having an incorrect prescription can leave you with headaches, eye strain or even nausea. At a certain age, most people cannot dodge presbyopia. But it’s good to know that the right lenses can make it a lot easier.